Over 190 countries are negotiating in Paris a global agreement to stabilise climate change at less than 2℃ above pre-industrial global average temperatures. For a reasonable chance of keeping warming under 2℃ we can emit a further 865 billion tonnes of carbon dioxide (CO2). The climate commitments to reduce greenhouse gas emissions to 2030 are a first step, but recent analyses show they are not enough. So what are the options if we cannot limit emissions to remain within our carbon budget? Emitting more than the allowance would mean we have to remove carbon from the atmosphere. The more carbon we emit over the coming years, the more we will need to remove in future. In fact, out of 116 scenarios consistent with 2℃ published by the Intergovernmental Panel on Climate Change, 101 scenarios require the removal of CO2 from the atmosphere during the second half of this century. That’s on top of the large emission reductions required. So how do we remove carbon from the atmosphere? Several technologies have been proposed to this effect. These are often referred to as “negative emissions technologies” because the carbon is being removed from the atmosphere (in the opposite direction to emissions). In a study published today in Nature Climate Change, which is part of a broader release by the Global Carbon Project, we investigate how big a role these technologies could play in halting global warming. We find that these technologies might play a role in climate mitigation. However, the large scales of deployment currently used in most pathways that limit warming to 2℃ will be severely constrained by environmental and socio-economic factors. This increases the pressure to raise the level of ambition in reducing fossil fuel emissions now. The technologies range from relatively simple options, such as planting more trees, which lock up CO2 as they grow, or crushing rocks that naturally absorb CO2 and spreading them on soils and oceans so they remove CO2 more rapidly. There are also higher-tech options such as using chemicals to absorb CO2 from the air, or burning plants for energy and capturing the CO2 that would otherwise be released, then storing it permanently deep below the ground (called bioenergy with carbon capture and storage). We examined the impacts of negative emission technologies on land use, greenhouse gas emissions, water use, earth’s reflectivity (or albedo) and soil nutrient loss, as well as the energy and cost requirements for each technology. One major limitation that we identified is the vast requirements for land. About 700 million hectares of land are required to grow biomass for bioenergy with carbon capture and storage at the scale needed in many 2℃ pathways. This would remove more than 3 billion tonnes of carbon from the atmosphere every year and would help to compensate an overshoot in emissions earlier this century. The area required is close to half of current global arable land plus permanent crop area. If bioenergy with carbon capture and storage were deployed at this scale there would be intense competition with food, water and conservation needs. This land requirement has made other negative emissions technologies attractive, such as direct air capture. However, current cost estimates for such technologies are between US$1,600 and US$2,000 per tonne of carbon removed from the atmosphere. In contrast, the majority of emissions with a carbon price in 40 national jurisdictions have a cost of less than US$10 per tonne of carbon dioxide. The study shows that there are many such impacts that vary across technologies. These impacts will need to be addressed and should determine the level at which negative emission technologies can play a role in achieving climate mitigation goals. 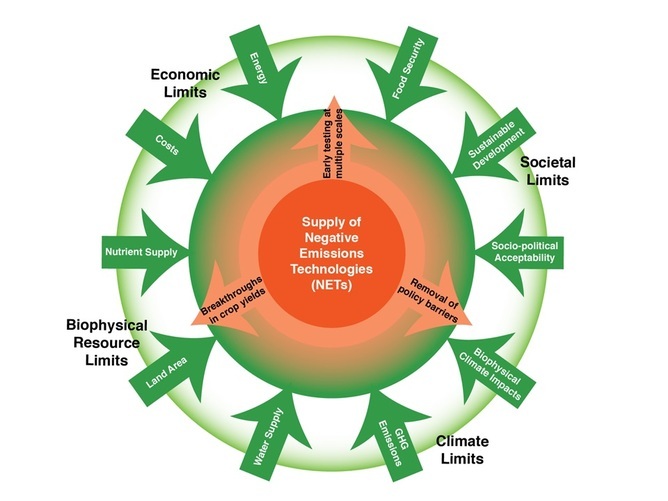 We conclude that, given the uncertainties around large-scale deployment of negative emissions technologies, we would be taking a big gamble if actions today were based on the expectation of heavy use of unproven technologies tomorrow. The use of these technologies will likely be limited due to any combination of the environmental, economic or energy constraints we examined. We conclude that “Plan A” must be to reduce greenhouse gas emissions aggressively now. A failure to initiate such a level of emissions cuts may leave us with no “Plan B” to stabilise the climate within the 2℃ target. The technologies of today are not the technologies of tomorrow. However, a prudent approach must be based on the level of climate abatement required with available technologies, while strongly investing in the research and development that might lead to breakthroughs that will ease the formidable challenge ahead of us. Featured image: Flickr CC, David Clarke.